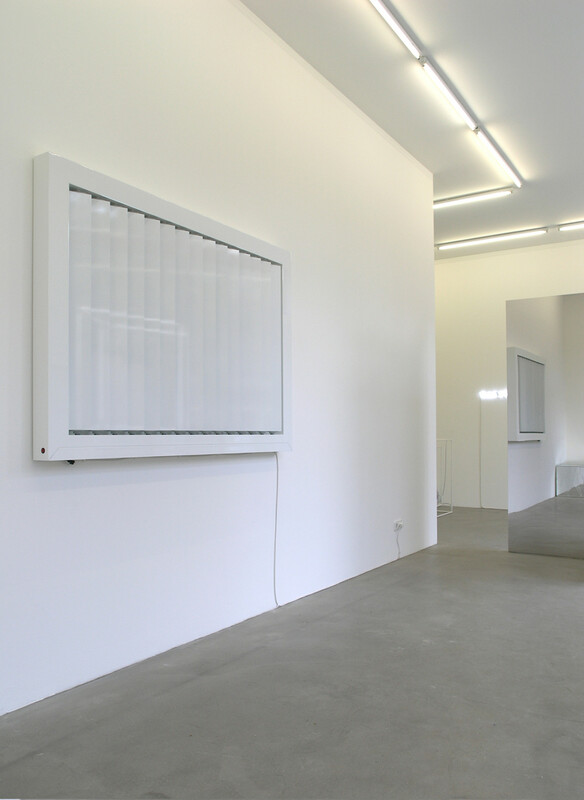 “Minimal Overload” is the second solo exhibition from the Danish artist Jeppe Hein (born in 1974) to be shown at KÖNIG GALERIE. The title unites two seemingly mutually exclusive meanings and thus opens up the reference system of the exhibition. The 13 pieces of the exhibit fill up the space of the gallery as never before. 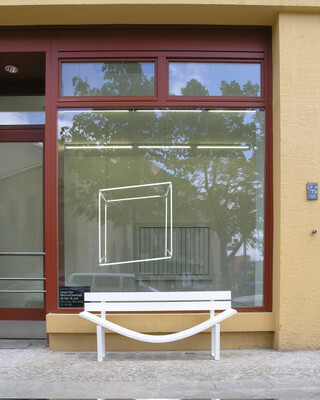 A white square turns around in front of a white photo mount; a white cube threatens to burst into flames; another cube floats free; a small hole in the wall suggests forbidden sights; any persons seated on a curved park bench are involuntarily pushed together. 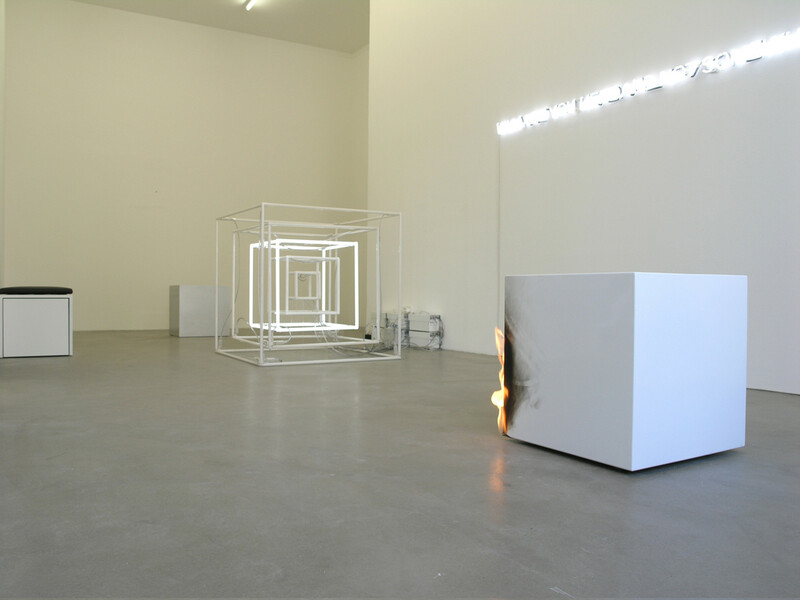 A small mirrored gallery creates visual doubles of these and other works through which a question on personal consciousness on the wall in neon letters – “Why are you here and not somewhere else” – is spatially counteracted. 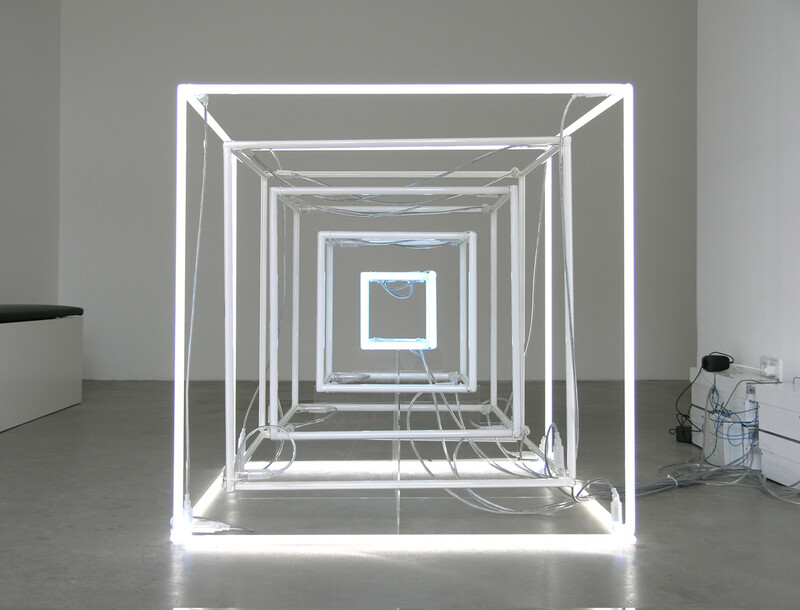 The viewer has difficulty in perceiving the objects as individual pieces: initially, distance to the object, the scrutiny and contemplation thereof, and the staged moment of Minimal Art are lost in the concentrated arrangement. In “Minimal Overload”, it is not the individual objects that come to the fore, it is the mass of ideas. The individual pieces reciprocally evoke and cause performativity, the playful appropriation of ideas – from Robert Morris or Dan Graham, for example – the self-referencing of the works and the integration of earlier works from the artist give the impression of a complete installation and not a collection of individual pieces. The result of this overloaded arrangement is a kind of obstacle course for the viewer that the artist connects to his earlier exhibition “360° Presence” (2002). Then, it was the movement of the viewer that made the large metal ball move, now in “Minimal Overload”, the viewer is not confronted with empty space, rather with a room full to bursting, barely allowing the viewer to take in what he or she is seeing.